So What Exactly is a Text Completion? Okay, welcome to the first module--first video for the new GRE verbal section. 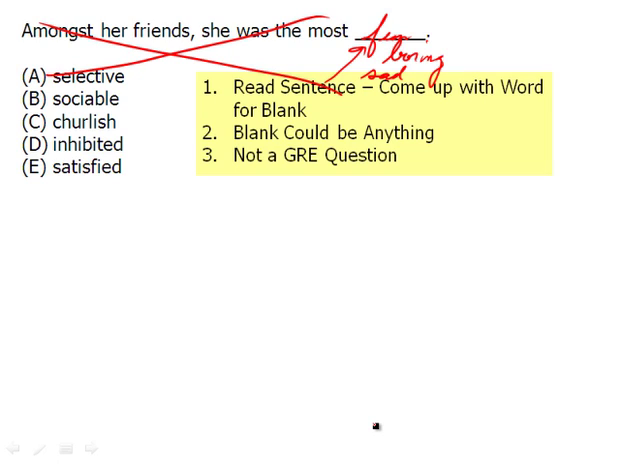 In this video, we are going to meet the text completion, and we are going to learn some basic strategies that apply to one blank, two blank, and three blank sentence completions. Indeed, basic strategies we're about to learn even work for sentence equivalent questions. So, listen up. This is some important stuff. So, first off, let's meet what looks like a text completion. "Amongst her friends she was the most, blank?" So, what should I do? Well, I should try to come up with a word here that goes in the blank. So, come up with the word for the blank. Well, her friends are kind of boring, I'm guessing, so she was the most fun. Well, maybe her friends were actually the fun ones, and she was the most boring. Perhaps, it has nothing to do with fun or boring. Maybe she's just really sad, or wait a second. After the comma, starting with often, we now can learn a little bit more about the 'she.' "Often walking over to a group of people she had never met before and introducing herself." So, we've read now the entire sentence, and we're going to come up with our own word here, once we have found what I call the clue. And the clue is the part of the sentence, it could be a word, it could be a phrase, that tells us about the blank, and I'm underlying the parts that are important. She have never talked to these people before, but yet, she would go up to a group of people, and she would introduce herself. Wow, what sort of person would that be? Well, you're going to have to come up with your own word. What? Really? Yes. You do not want to go down to the answer choices. Herein these words are the trap, or herein lies the traps because if you do not think through a sentence yourself, and you simply start plugging in the answers into the blank, you could convince yourself of quite a lot of things, and that's why we come up with our own word for the blank. And so, we know she is likely to go up to anyone and introduce herself. So, she is the most friendly. Maybe your word is outgoing. It doesn't matter. As long as you come up with one word, and then you match that word with the answer choices. So, let's start with A, selective. If you're friendly, by definition, are you selective? No. If you're friendly, if you're outgoing, are you social? Yes, those words are synonyms, and there, we have an answer, but it's a good idea to look at the other words. What does churlish mean? Well, maybe you don't know. What does inhibited mean? Inhibited is a little bit more common of a word than churlish. Inhibited means that you're shy. We know she's anything but shy, and then we have satisfied. You could be friendly, but you're not necessarily satisfied. The two words don't quite relate. Sociable works perfectly, and there is our answer. Churlish, by the way, the difficult word here isn't necessarily the answer because we've already found an answer. Churlish means rude and ill mannered. It doesn't work here, but we've followed these basic steps. Again, read the entire sentence. Find the clue. Those are these keywords or phrases that tell you what the blank is about.